Bronchoscope 470 Series is a high-resolution digital video bronchoscopes use miniature chip technology to set new standards in imaging quality for examination of trachea, bronchi and lungs. Fujinon Bronchoscopes incorporate advanced color chip CCD technology in the scope tip to provide brilliant and clear images that enhance procedure efficiency and effectiveness. More importantly, this miniature chip technology has allowed for a 17°c reduction in distal end diameters for standard bronchoscopes (EB470S). Fujinon’s Bronchoscopes are designed to maximize flexibility throughout the product and thus provide greater maneuverability for the physician. The short rigid section at the distal end has been reduced in length to improve insertion into the Upper Lobe Bronchus and facilitate access to the Peripheral Bronchus. The new miniature CCD chip in the end of Fujinon. 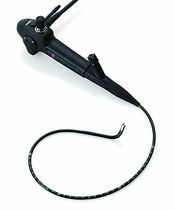 EB-470T therapeutic bronchoscope provides for increased working area within the traditional 5.9mm outside diameter. As a result, this advanced product offers a generous 2.8mm working channel for improved therapeutic access. Accessory utilization and performance in traditional scopes was often limited by the design of the forceps tube junction. To maximize the range of compatible accessories and improve procedural performance, Fujinon’s new bronchoscopes incorporate a newly designed forceps tube junction. The generous working channel and a redesigned forceps tube junction increase the range of therapeutic accessories that can be used with the new Fujinon bronchoscopes.